Why not celebrate with your MJC family? 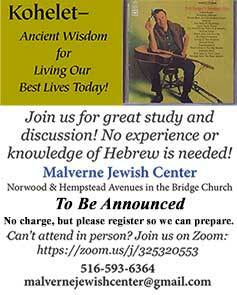 Call the Synagogue Office to make your reservation now! The idea of a public place for ritual and worship is as old as humanity, with the remains of ancient altars and temples found throughout the world. The modern synagogue combines in its physical structure and in its prayers and ceremonies, the memory of such places in the history of Judaism. The Tabernacle continued to serve as the spiritual focal point for the Jewish people in the Land of Israel for another 440 years. It stood for 14 years in Gilgal, for 369 years at the “threshing floor of Shiloh” (presently a West Bank “settlement”), and for 57 years in Nob and Gibeon. The Temple was destroyed by the Babylonian army of Nebuchadnezzar in 586 BCE, and the Jewish leadership was exiled, many into slavery in Babylon. When the re-building of the Temple began in 515 BCE, after the return to Jerusalem, Ezra the scribe instituted the public reading of the Law, which is now a centrepiece of the synagogue service. In 70 CE the Second Temple in Jerusalem was destroyed by the Romans. Rome celebrated its victory by building the Arch of Titus, which still stands in the Forum there. The facade of the Arch shows the Roman legion in its triumphal procession in Rome, bearing the sacred objects of the Temple including the menorah, which has never since been found. The word “synagogue” is simply a Greek translation of the Hebrew ‘Beit Knesset’, meaning ‘House of Assembly’. Other Hebrew terms, less frequently used, describe the synagogue as a ‘House of Study’, or a ‘House of Prayer’. A synagogue is the social, intellectual and spiritual centre of its Jewish community’s life.